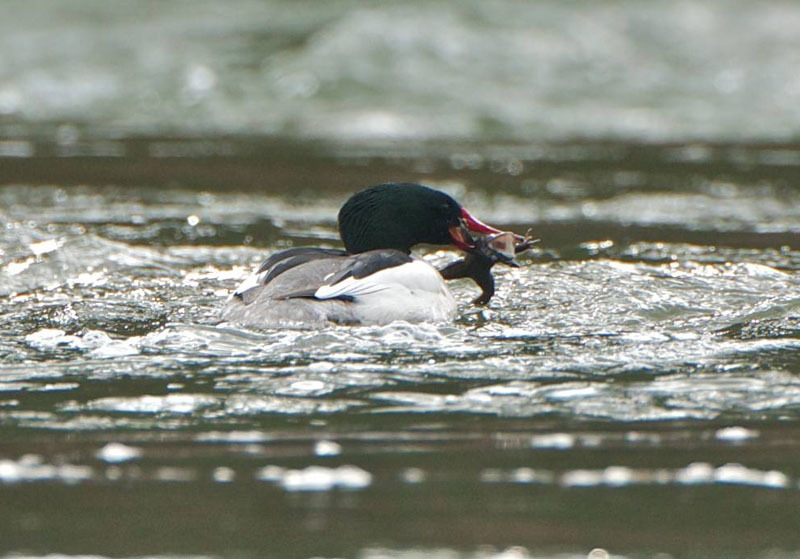 The Common Merganser is one of our biggest ducks, about the size of some loons. Although it’s not closely related to loons, it has evolved a similar overall structure and predatory behavior. 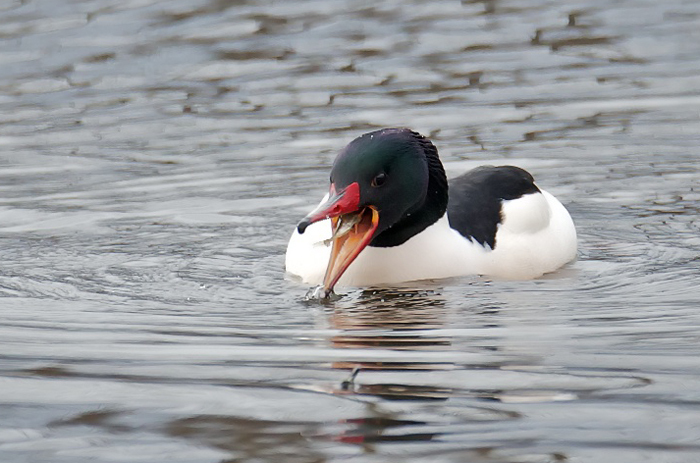 But a merganser has a unique feature: tooth-like serrations along the edge of the bill that help the bird grasp slippery fish. 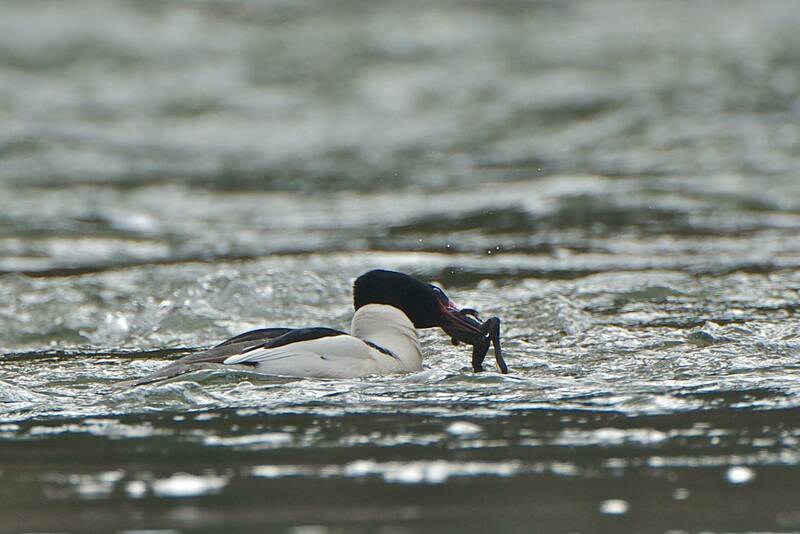 Common Mergansers nest in the northern states and Canada. So do loons. But loons nest on the ground at the edge of a lake, while the mergansers nest mostly in tree cavities and rock crevices near large lakes or along rivers. On a northern lake surrounded by dense evergreens, a large water bird rests on the surface. Its long, slim body – more than two feet of it – appears mostly white, the back black, the head a deep green. And all of it glistens. The bird dives under, a graceful sliding motion. Then returns to the surface with a fish grasped firmly in its beak. 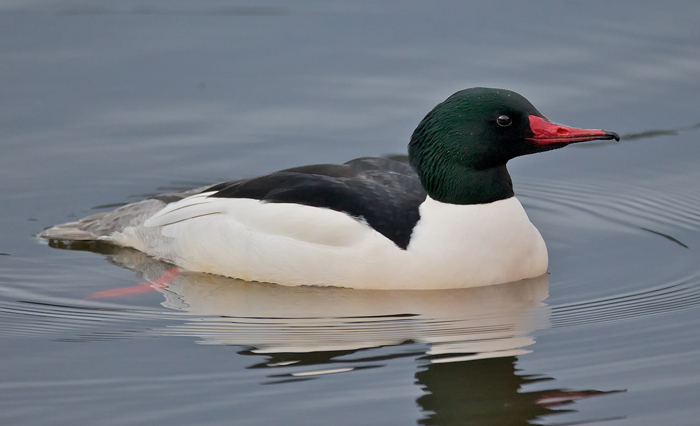 The Common Merganser is one of our biggest ducks, about the size of some loons, or even a small goose. Although it’s not closely related to loons, it has evolved a similar overall structure and predatory behavior. But a merganser has a unique feature that a loon lacks: tooth-like serrations along the edge of the bill that help the bird grasp slippery fish. 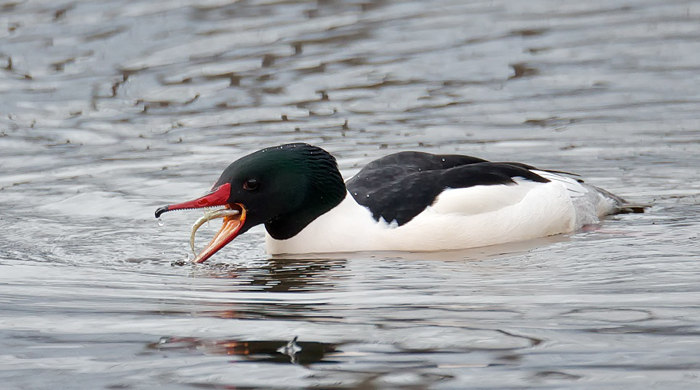 Common Mergansers nest in the northern states and Canada. So do loons. But loons nest on the ground, while mergansers nest mostly in tree cavities and rock crevices. Cavities big enough to house a hefty 3½-pound female, plus about a dozen jumbo eggs. Bird sounds recorded by Lang Elliot, musicofnature.com: Common Loon brief vocalization, 43039 and 61558 recorded by William W. H. Gunn; and are provided by The Macaulay Library of Natural Sounds at the Cornell Lab of Ornithology, Ithaca, New York.